Take a look at Luke 11. The disciples ask Jesus “Teach us to pray.” And then he says to them, “When you pray, say ‘Father, who art in heaven’…” (Emphasis mine.) Jesus doesn’t say “When I pray, I pray ‘Father. '” No, He tells them “When you pray, call Him Father.” Of all the names God could insist we call Him, He wants to be called “Father.” He doesn’t ask to be called Lord, or LORD, or King, or God, or Master, or any of those things. And He could rightly demand that we address Him as such. If I were to address the president, I’d call him “Mr. Obama,” or more likely “Mr. President.” If I would give the POTUS the respect he deserves, wouldn’t I offer the same to the God of the Universe? Of course. And yet, He doesn’t ask us for that. He deserves that, but instead He wants us to call him “Father.” The fullness of God’s glory is recognized through the Son. And the Son says “Call him Father.” How awesome! Monday night, at my jazz gig at The Slipway, I was discussing an upcoming absence of mine, and inquiring with the guys in the band about a sub. Steve Grover’s name came up as a possibility as a sub, but guitar player Dave said “I think I heard he’s struggling with cancer.” That’s the first time I heard such a thing. In 1990, I was a Jazz and Contemporary Music major at the University of Maine, Augusta. The jazz program there was highly regarded at the time; it was where players went who couldn’t afford Berklee. I, of course, couldn’t afford Berklee, so UMA made a good choice. It was affordable, a fine school, and only an hour away from my parent’s house, so I could live at home. So I did. And Steve Grover was my drum instructor. So intense was that music instruction that the one hour weekly lesson actually counted as two credit hours. I learned so much from Steve in that one semester, it’s unreal. So much of who I am as a jazz player came directly from Steve. I took jazz band in high school, and studied drums privately, but not really JAZZ drumming. That all came from Steve. Steve taught me the hemiola. Steve taught me independence, and comping. Steve beat alternating sticking into my head. He taught me how to count out loud by insisting that I do it–something I try to get MY students to do. And it was Steve that realized I’d been playing my right and left flams backwards for years! He made me go back and re-learn them–something that was very hard to do. All this stuff from Steve. Last night, just before 6pm, I was just about to start another gig, when I took a quick glance on Facebook. Steve died. Rest in peace Steve. You made a difference in my playing, and you made a difference in me. OK, I’ve got one more historical flag left in my collection that relates to the Revolution. It’s the Gadsden flag. 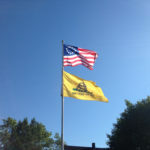 Some people know it as the “Snake” flag, or the “Don’t Tread on Me” flag. 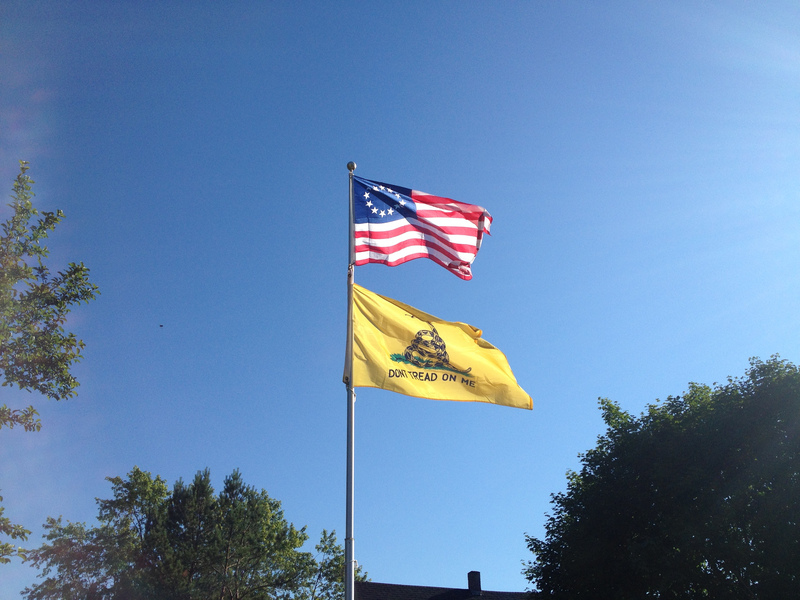 General Gadsden was the designer of the flag. Congress appointed some Marines to go along with Washington’s Navy (see the Washingston’s Cruisers flag), and those Marines carried this flag. It flies today in downtown Spruce Head America, and this flag is a particular favorite of Mrs. Batty.